Plans proceed apace as the Sundbacks of Sheperdstown, West Virginia won the White House Christmas Tree Sweepstakes or better yet, are now known officially as the Grand Champions of the National Christmas Tree Contest. Since 1956, the couple, Eric & Gloria Sundback, now in their eighties, have discouraged deer and fought hard against Mother Nature's more harmful weather whimsies to keep the trees growing strong while some are tall. Their tenacity won spots to have their trees ferried to the White House several times over the decades. Horticulture and forestry experts, they started because they could never find a tree that suited them, so hence their own orchard. Rosalynn Carter & Nancy Reagan also decorated trees from the Sundback farm. Michelle Obama's first Christmas in the White House will see her taking receipt of a Fraser Fir tree from a lifetime of hard work finding better needle retention and increasing branch strength on a horse drawn sleigh. This is the third year in a row the Fraser Fir has beat out the Pines, Spruces and Nobles. Hillary Clinton had a spectacular tree skirt from 1993 as part of her A Visit from St. Nicholas theme. The ornaments were from architecture students that was pretty spectacular under this 1995 Fraser Fir. For comparison below, the 1993 Tree which was Hillary's first at the White House. There are exactly 118 days until Christmas, but the Obama White House must have the up to nineteen foot tree (and no higher) selected from Eric & Gloria Sundback Trees delivered a few days after the presidential turkey pardon on the picturesque sleigh. 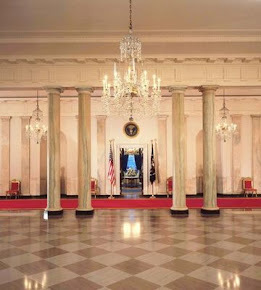 The tree will have a special topper that cannot brush the ceiling directly below the gilt ceiling medallion to make the holiday tableau wonderful for what will be one of the most highly photographed and trafficked areas for the Obamas first Holiday Season. The velvet ropes around the tree keep people form handling the sometimes delicate or antique ornaments. Pat Nixon sent waves a shock through the choice of an atomic symbol rather than the sedate star normally used. As discussed on White House Christmas in July post on the volunteer elves need three days to trim out the place with decor that follows the theme which remains a closely guarded secret for the Obama White House. Sasha, Malia and Bo will have some definite ideas about what goes on the tree and under the tree. A gingerbread house is in order for this year and perhaps Michelle will ask Roland Mesnier to consider making one and decorating it as he has in the past for Laura Bush. President Kennedy & Jacqueline Kennedy displayed this official tree as part of the Nutcracker Theme of 1961 inaugurating the idea of a theme. Barbara Bush repeated the Nutcracker Suite theme in 1990. Hillary Clinton took another swing at the popular Nutcracker theme in 1996. In 2002, Laura Bush had an almost nineteen foot Noble Fir delivered from Hedlund Christmas Trees from the northwest in Elma,Washington. They too were experienced with the rituals of White House Trees having made the trip a few years before after winning the honor to give first lady Hillary Clinton the tree. You have to win the contest from the National Christmas Tree Association (NCTA) first. Next, the tree selected for either the White House or The Vice President's place at One Observatory Circle is a direct result of a full scale competition complete with airline reservations, refrigerated trucks and professional tree handlers. My best analogy is its like the Westminster Dog show for elite, carefully bred living trees with 5 categories and a gnarled tree twist. One American farm gets to enter their top two trees and if selected the winner by a panel of outside judges, that farm is retired from competition for the next three years. This is the 2007 delivery of a Fraser Fir with Laura Bush as she kicked off the Holiday in the National Parks theme that required an ornament to commemorate each of the 391 National Park Service sites. The trees take almost a decade to get to the required height, but that may be more accidental than planned. Since 1966 the NCTA has presented the tree. The first lady's team in the East Wing strive to come up with a theme that the Residence staff of exemplary pastry chefs, carpenters and electricians work to implement. In 2008, the Obamas spent Christmas in the Aloha State before changing climates to arrive in an icy DC in time for the girls to start a new term at a new school in their new home city. 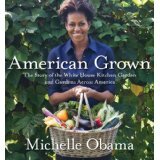 This is Michelle Obama's maiden Holiday season and it will be interesting to see how many fresh and exciting new ideas she can come up with to celebrate a cherished part of the Season! We shall be eating a few sugar plums with joyous anticipation as snugly in bed as the laptop allows and watching ... closely just like Santa Claus does for the Obamas. It will be so different from 2008 getting the tree. Malia & Dad go searching for their last tree in Chicago as a family before entering the White House. A new level of entertaining ahead as the White House has not had presidential children to celebrate the Holidays in decades. Update: Here is another link explaining a bit more about the White House Holiday planning process that picked up steam in July. this is the moment i have been waiting for. it's one of those 'goosebump' moments - those moments that you never thought you'd see with a Black First Family. not only do I want to see Malia and Sasha light the tree, but I absolutely cannot wait for Michelle Obama to do her own ' White House Christmas' special on HGTV. I want it so bad. Do you know how one would go about volunteering to help decorate the White House for the holidays? I have wanted to help for several years now, but I have never had any luck. I am a floral designer based in south Georgia and would love to help out with next year's festivities.